“American Cool” – kudos on the exhibit. 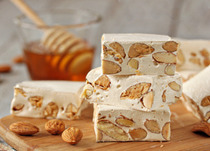 Torrone – Vin’s favorite treat. Studded tweezers, a “Celebration” bar, and jewelry.